It began with dead cockroaches and trash cans chained to the wall. Christy Johnson Moore hadn’t been inside of a laundromat in years. When she washed laundry with her mother and sisters, as a child, she didn’t remember them being so disappointing. She didn’t expect the terrible conditions of present-day laundromats. Toilet paper required payment. The space was gross: dirty, peeling paint, foul smells, machines in need of repair, dismal, depressing. This community ‘hub’ was letting everyone down, and why? Were the folks who couldn’t afford in-home laundry services so untrustworthy everything had to be superglued to the ground? We all know what happens when businesses develop tunnel vision around profits and lose sight of what matters most: people. 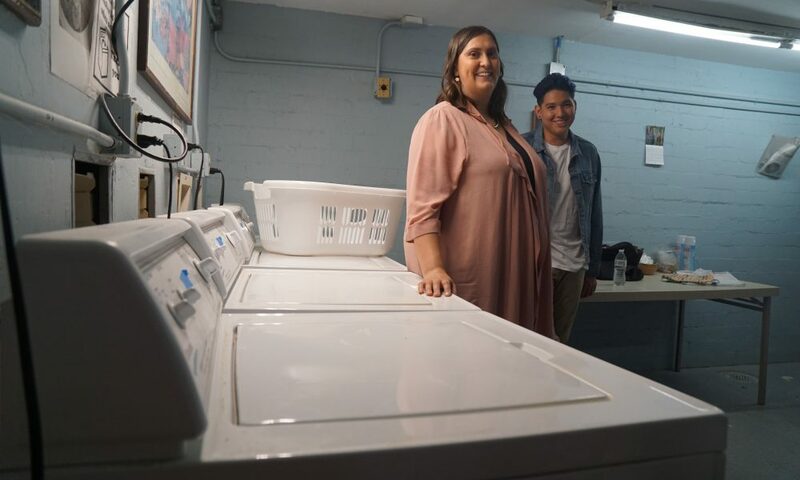 She went home to her patient and calm husband, Mitchell, with an idea to completely transform the laundromat industry. That’s how she works. She wasn’t going to change one laundromat, she would change the entire business model and customer experience. What followed an overwhelming feeling of disappointment in the laundromat industry was a feeling of direct alignment between this forgotten space and Christy’s personal and professional values: respect, family and independence. Christy didn’t always know exactly how her personal values should align with her professional experiences. She says with “intentionality and a coach,” over the course of a year, she was able to clarify what her values are: respect, family, independence. If Social Spin was going to operate, it would operate based on that axis of values. See our recent blog for more on the importance of knowing your values in changing the world. 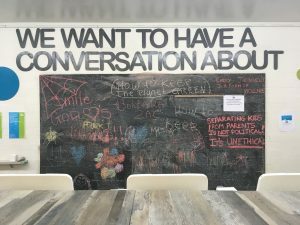 Respect also operates as a 10-foot, ceiling to floor chalkboard across the longest wall at Social Spin. Respect means asking questions, listening and creating solutions. Phoenix Center for the Arts offering children’s arts and culture workshops while parents enjoy some free dryer time. Aunt Rita’s showing up to provide customers with free at-home kit HIV/AIDS tests. St. Joseph the Worker coming on-site to provide resources for job-seeking customers. Christy focuses on helping people become independent, families become secure and respect remaining a non-negotiable. It doesn’t have to be a lot to ask the businesses you support to do more than just say the words. Live them. Breathe them. Embody them. Spread them. Christy has worked with so many demographics at such varied states of need and success. Her family, beyond her literal family, is the community and she acts like it. Part of living the family value is making sure everyone in the family has opportunity. Social Spin wants to teach as many people as possible how to get started in the working world. They are partnered with several non-profits, such as Jewish Family and Children’s Services, who refer opportunity youth transitioning out of foster care; and Friendly House, referring youth transitioning out of prison. Social Spin offers them 5-8 week on-the-job training programs. They are also partnered with Valley Life who comes in with a team comprised of individuals with disabilities to help process wash and fold orders. As Social Spin grows, so too will the number of people in the community affected by the opportunities provided through its partnerships. When your ideas are bigger than your funding, growing pains can be hard. Christy hopes to expand to five locations within five years. A second location is already scheduled to open in February 2019. Sometimes making it through the process is the hardest part, but Christy is committed to living 95% in the present, while checking herself when she spends too much time in the past or future. Any change-engineer knows how hard of a task this is: lots of deep breaths. Financing a business loan with a reasonable interest rate, is not easy. Getting enough funding or volunteer support in the beginning, in the ‘up and running’ phase of new businesses, is hard. It means Social Spin sees Christy more than her husband or dog, Roxy. Christy doesn’t have all of the answers, but she has an amazing team. After years of showing up and helping others, she has created such a significant web of authentic partnerships. She didn’t even know she knew people in the laundry industry when she set out to change it. She gained access to several mentors and coaches who filled in the spaces experience has yet to occupy. When renovations for the first Social Spin were underway, the efforts were led by volunteers, volunteers who support Christy because they know she cannot help but change the world. Changing an industry is a heavy load to carry. This is a drop in the bucket, folks. 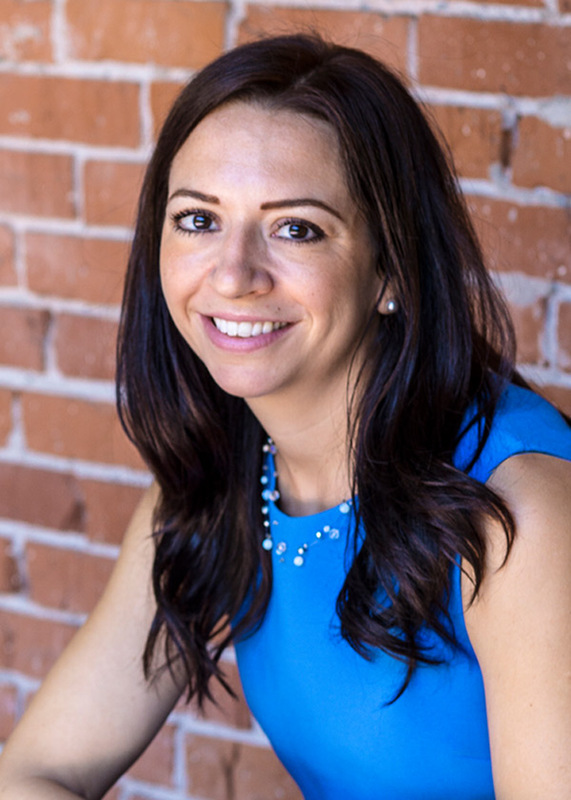 If you want a more comprehensive, intimate understanding of what an amazing change-engineer Christy Johnson Moore is, you have to listen to last week’s podcast interview on How to Change the World with Javelina CEO Catherine Alonzo. You should probably prepare with a notebook and pen because you’re going to be inspired to widdle 100 values into your top 3 and to make sure the way you’re operating is aligned with them.